Eighteen years ago, a small company was born in SA with the sole purpose to improve the quality, performance and comfort of Australian built ski boats. Through relentless research and development of construction methods used from around the globe, Matrix rapidly spiralled to the top of the Australian boat building industry and to this day, remains at the top. From below the waterline each Matrix is designed with performance in mind. 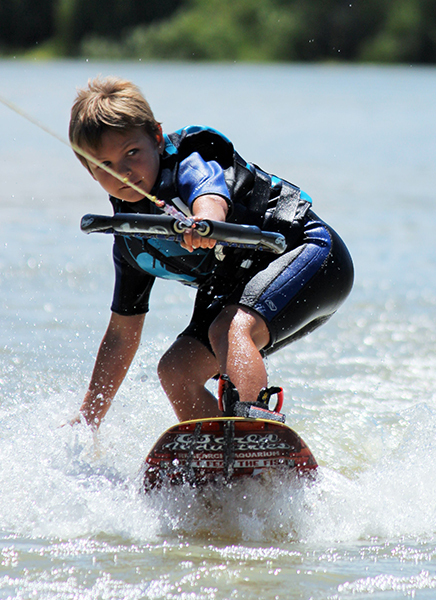 Whether its flat soft slalom wakes you crave, huge wakeboarding launch ramps or peace of mind across rough waters with the family. Matrix has a boat that will suit your every desire. Quality manufacturing practise means the Matrix boats are built to be enjoyed for years to come. Fibreglass stinger & flooring systems offer a timber free chassis which won’t break down or rot over time. The hull and deck is locked together using a fibreglass shoebox bonding system, which incorporates seating frames through the boat to ensure a solid bond. All fittings used are stainless steel and the upholstery construction is like no other designed in Australia. The highest grade marine vinyl and carpet, finish off the interiors stylish looking upholstery, while it’s the firm but soft feel derived from the three layered, dual density foam in the seat bases that sets Matrix seating comfort ahead of the rest. All Engines are installed using a though bolt system, giving superior strength over a standard coach bolt application. Warranty & service is conveniently obtained at any of the Matrix dealer’s located Australia wide. Now eighteen years in, Matrix boasts a proven resale advantage. Our advanced manufacturing techniques and careful product choice gives every customer one of the highest resale dollars on the market, keeping your dollars safe. All service, spare and repair parts are constantly in stock in Australia, so there is no lengthy waiting periods to get your boat back on the water, unlike our import competitors, giving you stress free years to come. Our dealer network has years of proven dealer performance and the long standing relationships we have ensures our dealers know as much about our boats as we do, unlike our import competitors.